We are on the road today and tomorrow heading down to Origins 2013. 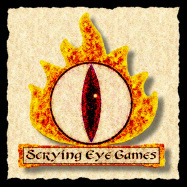 Mesa Mundi will be helping out at booth #535 -- D20Pro/Scrying Eye Games. Stop by to see interactive demonstrations of D20Pro on the Monolith touch screens. We will also be showing how digital signage can be used in the gaming show setting to enhance customer engagement for artists, content writers and, well, everyone. We will also have a table setup in the D20Pro game area running adventures and casual games for general enjoyment and entertainment. In those rare cases where a product cannot be sold across international boundaries, we will gladly help you locate a local seller. 2014 was an exciting and wild year for Mesa Mundi. We spent a lot of time racing to get ahead of our work loads and to... Read More. We will be stationed in booth #617 at Gencon 2014 starting August 14th. In addition to representing ourselves as a bastion of multitouch in a hall... Read More. Copyright © 2019 Mesa Mundi Inc. | Store. Ecommerce Software by Shopify. A theme by Pixel Union.